My general reaction throughout “Prince Caspian” was awe; this movie isn’t mind-blowing in its own right, and won’t revolutionize filmmaking. I was in awe that the film so masterfully and enormously improved upon its predecessor. See, while I enjoyed “The Lion, the Witch, and the Wardrobe” when it first came out, its huge and deadly flaws have become more apparent with time. Let me sum up my thoughts on the first film; my biggest complaint for the first movie was that the acting on the parts of the children was awful. Cringe-worthy, look-away, unbelievably awful. Skander Keynes was a solid Edmund, but William Mosley was a terrible Peter, Anna Popplewell a weak Susan, and Georgie Henley an atrocious Lucy. Yeah, I know they’re young, but the producers could have given these kids an acting 101 class. They had zero chemistry, delivered the bad dialogue terribly, and were generally un-convincing in their roles. The adaptation of the film was solid, but left out some of the really cool animals (like the bear) in favor of strange ox-men with axes and giant battle scenes. The battle at the end ruins the whole movie; its cheesy and out of place, and the directing was pretty bad throughout. There were a lot of silly moments and lines, like Lucy saying “Narnia’s not going to run out of toast, Ed.” That’s always gotten on my nerves. The CGI and make-up was pretty bad, and the creatures looked ridiculous. There were some redeeming moments, though. Tilda Swinton was perfect as the White Witch, and made the movie worth watching. James McAvoy was a great Mr. Tumnus, and Jim Broadbent’s small role as the professor was classic. There’s plenty of good in “Lion, The Witch and the Wardrobe,” but for me, the bad outweighs the good. It’s too long, and there are too many moments not found in the book only included so there can be more battle scenes; all the new scenes were bad. Suffice to say, I was not excited for “Prince Caspian.” The book is weaker than the book version of “Lion,” and none of the casting really excited me. I went into “Caspian” with low expectations, expecting to be disappointed. Five minutes into the film, my thoughts had changed. The opening was actually pretty good…political intrigue and fun action in Narnia. That’s a good way to start. By the end, I was blown away. I can say without hesitation that “Prince Caspian” is infinitely better than its predecessor, for many reasons, and improves upon nearly every negative aspect of the first film. The plot of “Caspian” revolves around the Pevensie children being summoned back to Narnia after Prince Caspian, on the run from his villainous uncle, blows the magical horn that belonged to Susan. The Pevensie children have only been gone a year, but 1300 years have passed in Narnia and the Telemarines have taken over, having wiped out nearly all the Narnians. The Pevensies and Caspian team up to take down the Telemarines and unite Narnia again. The story of “Caspian” is not as interesting as the story of “Lion;” of the books, “Lion” is easily the best. One of the most major achievements of “Caspian” is that it makes its story much more interesting than the plot in the film version of “Lion.” All the characters are still in place, and the situation is the same, but the film changes the books in ways that make it much more suitable for film; they make the plot more complex than “Lion” and it becomes a more rewarding film experience. The heart of the film is the political struggle between the Telemarines, their inner factions, and the Narnians. Various plot threads are set up that tie together and create a rewarding finale. The adaptation isn’t as accurate as the film version of “Lion,” but is actually better for it, and feels more film like. That’s one improvement, but the major improvement is the characters. In the film version of “Lion,” the only characters I really loved were Tumnus and the White Witch, but “Caspian” is full to burst of loveable characters, starting with Caspian X himself. Ben Barnes, a virtual unknown whose only film role thus far was the lead in last year’s “Stardust,” is a perfect Caspian. He portrays Caspian’s naivety as well as his courage, and is a hero we can root for. To illustrate the fact that Caspian and the Telemarines aren’t originally from Narnia, Barnes uses a sort of Spanish/eastern-European accent that is familiar yet original; it sounds very similar to Inigo Montoya in “The Princess Bride.” There’s a moment when Caspian is mad at King Miraz, because Miraz killed his father. I half expected to hear him say “My name is Prince Caspian; you killed my father; prepare to die.” The accent is awesome, as is the character. Peter Dinklage often steals the show as the grumpy dwarf Trumpkin, and Eddie Izzard gives a great vocal performance as the sword-wielding mouse Reepicheep. Both of these characters are beloved personas from the novels, and I was delighted to see them depicted so well on screen. There are plenty of other great side-characters this time around, which is the main thing that makes this film so much better than its predecessor. It has tons of characters we love, which is the magic of the books. As for the Pevensie children themselves, I was impressed. Not only has the acting improved immeasurably, the writing for them was much better as well. At the beginning of the film, they set up various problems each kid is having in their lives, and by the end, those problems are solved. The characters go through a very noticeable change, something not present in the first film. Skander Keynes is still the best actor of the four as Edmund; of the four, he’s the only one I can see having a lush acting career. Georgie Henley as Lucy is almost as good as Keynes, but in a different way. She’s a better actress this time around, and is able to portray Lucy as innocent and loveable, instead of annoying. Anna Popplewell as Susan is better this time around, but still has some moments of poor acting. William Moseley is a terribly weak Peter, and hasn’t shown much improvement from last time. Sadly, he happens to be the character with the most screen time, and being surrounded by better actors does him no favors. Ultimately, though, Caspian himself is the most interesting character. He gets plenty of moments to shine early on, but when he meets up with the Pevensie’s, his role is reduced to that of sidekick. 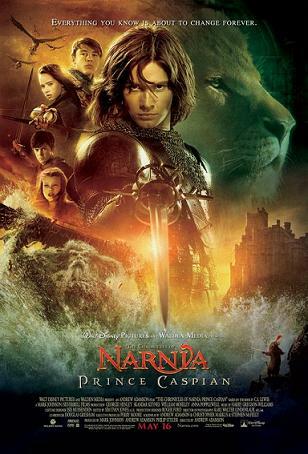 The movie is named “Prince Caspian;” when the titular character is so cool, I want to see more of him. But overall, the movie strikes a great balance between characters, and the film works because of its emphasis on characterization. “Prince Caspian” knows what kind of film it wants to be. “Lion, the Witch and the Wardrobe” couldn’t decide if it wanted to be a slavishly faithful adaptation or an epic battle film, and never found a balance. “Caspian” has firmly decided to be an epic with its roots in C.S. Lewis’ storytelling. That’s how it should be. There are more battles this time around, but the way the plot is reworked from the novel makes them feel natural, and are fun to watch. I have only two major complaints about the film; first, the villain is weak. Sergio Castellitto is an acceptable King Miraz, but it’s not until the halfway point when we learn why we should hate Miraz. Miraz’s character is very similar to Claudius in Hamlet, and I think the actor should have portrayed him as such. Polite in most scenes, but terrifying when he shows his true colors. Castellitto basically tries to act angry the whole time. This is the only element of the film that isn’t better than “Lion;” the white witch was a better villain. The run time is my second complaint. The film is way too long. There’s 30 minutes worth of unnecessary scenes, and I think there’s a phenomenal 110 minute movie hidden in this great 140 minute film. The finale has a few false climaxes that ruin the pacing, and that could have been smoothed out. In the end, there’s many more things I could nitpick; the film is definitely flawed. But there’s just way too much to love here for me to waste my time nitpicking. The truth is, this is the first great Narnia adaptation. All our favorite characters are up on screen, and the adaptation is great. “Prince Caspian” blows “The Lion, the Witch, and the Wardrobe” clean out of the water. The next film will be “Voyage of the Dawn Treader,” which is actually a better book than “Prince Caspian.” If “Treader” shows as much improvement as “Caspian” did to “Lion,” then the third film will be a masterpiece. But until then, I’ll wait anxiously for “Dawn Treader” and enjoy “Caspian” again whenever it hits DVD. Go see it, even if you didn’t like “Lion,” because “Caspian” is a major improvement.